My husband loves these butter cookies. The recipe is adapted from Laura Vitale, who uses a bit of shortening in the dough that gives it nice texture. 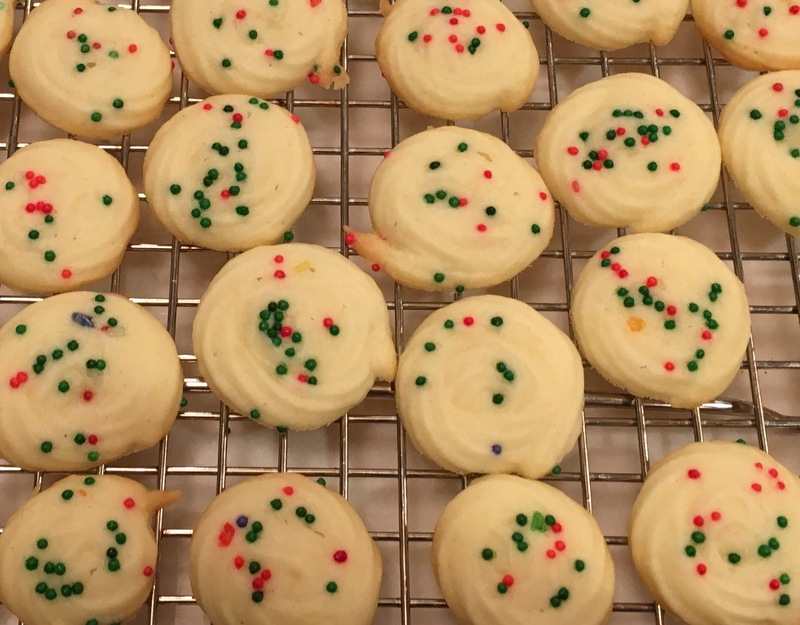 Butter cookies are rich, so you don’t need a giant cookie; I like to pipe the dough into one-inch buttons and top them with sprinkles. Piping the cookies gives them a more delicate texture. I use both vanilla extract and Italian vanillina (powdered vanilla flavoring) to flavor the cookies. You can order vanillina from amazon.com or just increase the amount of vanilla extract. Preheat oven to 350 degrees. Line two baking sheets with parchment. In a mixing bowl beat butters for a minute until soft and creamy. Add shortening and mix until smooth. Add confectioners sugar, vanillina, vanilla extract and salt. Beat 2 minutes until creamy and soft. Add cake flour 1 cup at a time and mix until smooth; it should be thick. Spoon batter into a pastry bag fitted with a star tube. Pipe dough into 1-inch round buttons. Top lightly with sprinkles. Bake for 10 minutes, rotating the pan half way through baking until golden around the edges. Place baking sheet on rack and let sit 5 minutes. Remove cookies from the baking sheet to a rack. Let cool completely. Store in an airtight container. Makes 80-100 cookies depending on the size you prefer. This entry was posted in Christmas, Cookies, Desserts, Easter, Thanksgiving. Bookmark the permalink.